Chris Connolly, a medical student from University of Michigan, talks about his disability and getting into medical school. Have you seen the #DocsWithDisabilities campaign? 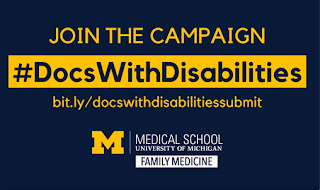 The University of Michigan Department of Family Medicine has launched a campaign to raise awareness about the number of practicing #docswithdisabilities in medicine via a social media campaign on Twitter and Instagram. The campaign is highlighting stories of various DWD (Docs with Disabilities). We invite you to join the campaign by contributing your story, normalizing the inclusion of DWD in the physician workforce. They are still accepting contributions. AAMC (Association of American Medical Colleges) and the University of California, San Francisco, School of Medicine (UCSF) released a first-of-its-kind publication that explores the current state of medical education for medical students and physicians with disabilities. Accessibility, Inclusion, and Action in Medical Education: Lived Experiences of Learners and Physicians With Disabilities is designed to increase awareness and understanding of the challenges and opportunities for individuals with disabilities at the nation’s medical schools and teaching hospitals. Physicians in procedural specialties are at high risk for work-related musculoskeletal disorders (MSDs). This has been called "an impending epidemic" in the context of the looming workforce shortage; however, prevalence estimates vary by study. To estimate the prevalence of work-related MSDs among at-risk physicians and to evaluate the scope of preventive efforts. Career prevalence of injuries and 12-month prevalence of pain. Among 21 articles (5828 physicians [mean age, 46.0 years; 78.5% male; 12.8 years in practice; 14.4 hours performing procedures per week]) included in this systematic review and meta-analysis, pooled crude prevalence estimates of the most common work-related MSDs were degenerative cervical spine disease in 17% (457 of 2406 physicians) (95% CI, 12%-25%), rotator cuff pathology in 18% (300 of 1513 physicians) (95% CI, 13%-25%), degenerative lumbar spine disease in 19% (544 of 2449 physicians) (95% CI, 5%-16%), and carpal tunnel syndrome in 9% (256 of 2449 physicians) (95% CI, 5%-16%). From 1997 to 2015, the prevalence of degenerative cervical spine disease and degenerative lumbar spine disease increased by 18.3% and 27%, respectively. Pooled prevalence estimates for pain ranged from 35% to 60% and differed by assessment instrument. Of those with a work-related MSD, 12% (277 of 2319 physicians) (95% CI, 7%-18%) required a leave of absence, practice restriction or modification, or early retirement. Heterogeneity was considerable for all crude analyses (mean I2 = 93.5%) but was lower for sensitivity analyses (mean I2 = 72.3%). Interventions focused on products and behaviors. Twelve at-risk specialties described a gross lack of awareness and an unmet need for ergonomics education. Prevalence estimates of work-related MSDs among at-risk physicians appear to be high. Further research is needed to develop and validate an evidence-based applied ergonomics program aimed at preventing these disorders in this population. Epstein S, Sparer EH, Tran BN, Ruan QZ, Dennerlein JT, Singhal D, Lee BT. Prevalence of Work-Related Musculoskeletal Disorders Among Surgeons and Interventionalists: A Systematic Review and Meta-analysis. JAMA Surg. 2018 Feb 21;153(2):e174947. doi: 10.1001/jamasurg.2017.4947. Epub 2018 Feb 21. PubMed PMID: 29282463.